AUSTRALIAN BUS OPERATORS are keenly watching developments in Germany with the new fully electric drive, ‘zero-emissions’ Citaro city bus to make its world debut in September at the 2018 IAA Commercial Vehicles show. As well as two battery modules on the roof, there are four modules in the rear of the bus as standard. 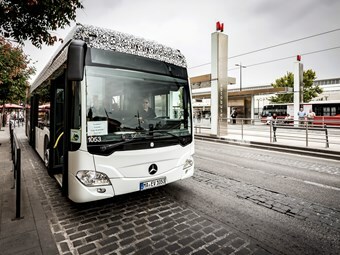 With the start of series production also taking place this year, local Daimler insiders were just shy of confirming to ABC magazine that the all-electric Citaro would land in Australia - pending any ADR, width and emissions compliance issues as has greeted previous diesel Citaros here. The 12-metre variant is said to offer, "an impressive and hitherto unknown standard of energy efficiency. The intelligent modular concept for its battery and charging technology is similarly compelling." In the hands of operators and on the roads here and in Australasian conditions, all will be revealed. On paper, though, it’s an exciting piece of electric kit and with the 50,000th example of the Citaro brand name being sold around the world recently, there should be ample market interest globally as to what this new all-electric Citaro will deliver. This new addition follows a strong lineage of Citaro innovation and usability, joining the more recent Citaro hybrid and the gas-powered Citaro NGT . An electric portal axle with electric motors at the wheel hubs forms the basis of the drive system, with claimed peak output of the motors rated at 2 x 125kW and 2 x 485Nm. Lithium-ion batteries discharge a total capacity of up to about 243kWh, split between up to a maximum of 10 modules. As well as two battery modules on the roof, there are four modules in the rear of the bus as standard. Bespoke customer requirements could see a further two or four battery modules mounted on the roof, according to Daimler.